Such is the convenience of dried pasta, making fresh pasta has been regarded as the preserve of authentic restaurants, Italian nonnas and die-hard foodies. However, there’s been a back-to-basics revolution in recent years and now many home cooks are in possession of a pasta machine. Dried pasta is very handy and the right choice for certain dishes but making pasta is very simple and extremely satisfying. There are three key ingredients used for egg pasta – flour, eggs and salt – but amounts vary; some chefs use more egg yolks, others add olive oil. Add a good drizzle of oil to the water – this will stop the pasta from sticking together. 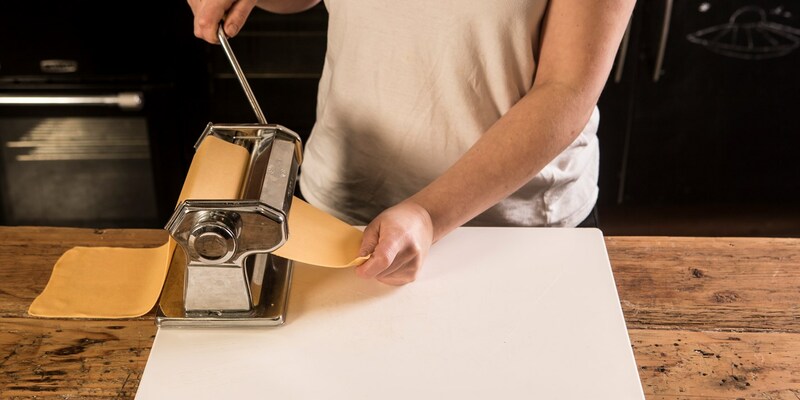 If you don’t have a pasta machine, use a rolling pin to roll out the dough, folding it between rolling as before until you are ready to roll out. Then roll to the required thickness, moving and flouring the dough constantly so it doesn't dry out. Boil a large saucepan of water, add a good drizzle of oil to the water – this will stop the pasta from sticking together. Add the pasta, stirring gently at first to separate the strands. Boil for 3–5 minutes until the pasta starts to float to the top. Drain immediately to ensure the pasta remains al dente. Use a large saucepan because it allows for continuous boiling which will ensure the pasta strips can circulate which prevents sticking. To dry fresh pasta, lay over coat hangers or the back of a chair and air dry until brittle. It can then be stored in an airtight container for 4–6 weeks. Once dried, the pasta will take longer to cook. Fresh pasta can be paired with lots of different sauces from rich, meaty duck ragu to fresh pesto. As Josh Eggleton's Fresh tagliatelle with tomatoes recipe demonstrates, sometimes it is better to keep things simple and let the natural vibrancy of a few fresh ingredients shine. Fresh pasta can also be used to make ravioli, cannelloni, lasagne or tortellini stuffed with anything from crab to goat’s cheese, butternut squash to truffles.